Remember, whatever type of vacation, whatever activity of interest or just looking for holiday ideas - Travel Cancun Vacations is your first destination! Take advantage of our Budget Planner to estimate your Cancun travel plans. Don't forget to subscribe to our on-line magazine to keep up with all the Cancun Vacation News. 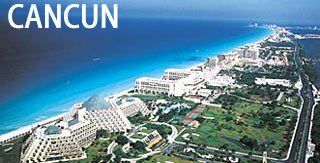 Travel Cancun Vacations offers on-line access to a wealth of Cancun Holiday Travel information. The service is quick and easy to use, you can search by region, city or activities. Compare hotels prices, meal plans, quality and location with a few quick clicks. Find out about tours, site seeing and restaurants as well. Click locations to try it! Although our vacation listings are kept current - remember to confirm pricing and reservation availability through our automated facilities. If you have a tourist destination and want it listed in Travel Cancun Vacations then click Add Listing. � Travel Cancun Vacations. 2004.